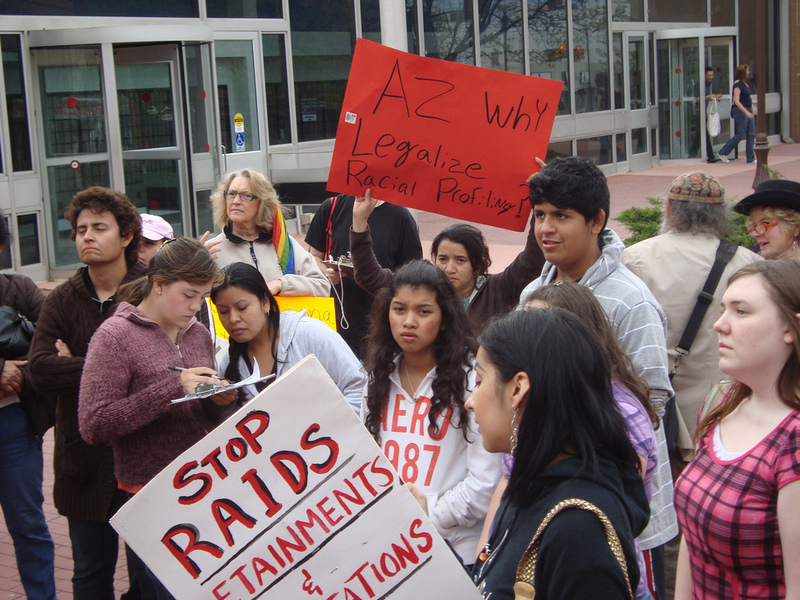 Racial profiling is officially legal in Arizona. “I do not know what an illegal immigrant looks like,” declared Governor Brewer of Arizona as she signed SB 1070, the draconian anti-immigrant bill that allows law enforcement officials to arrest people based on a “reasonable suspicion” that they are undocumented. Take action and ask the Obama Administration and the Department of Homeland Security to not cooperate with this misguided effort to enforce federal immigration laws. What is “reasonable suspicion?” Brown skin and quite possibly, a hint of an accent considered foreign to Arizona. Arizona Senator Russell Pearce (R-Mesa), the main sponsor of SB 1070, believes that fears of racial profiling are unwarranted, but admitted that “Ninety percent of the illegal aliens in Arizona come from south of the border, so it [appearance] certainly may be a factor.” Brewer also implied that immigration profiles will be created, by Arizona Peace Officer and Training Board (AZPOST). But she tried to assure everyone that she would not tolerate racial profiling, adding that law enforcement officials know how to do their jobs. Yes, therein lies the problem: people of color know precisely how cops do their jobs and SB 1070 breeds a climate of fear and distrust that would promote more crimes in Arizona as people lose faith in law enforcement. Many are threatening an economic boycott of the state and couched in terms of border security, SB 1070 would also cost Arizona $26.4 billion in lost economic activity. For the thousands gathered at the Arizona Capitol, 4/23/2010 is probably the day Arizona died. But it also marks the day that Governor Brewer gave an incredible gift to the movement-building efforts for immigration reform. You were wrong, Governor Brewer. This is not “what’s right for Arizona.” But it may just be what is right for organizing an organic movement. A 200,000 simulated rally in D.C. could not do what the mere threat of racial profiling legislation in the state of Arizona did: draw mainstream media attention, show that immigrant youth are leading the effort to fight for immigrant rights, and force important people to take a stand on the issue. Now take action here. Bring on the lawsuits and civil disobedience. ← Previous Previous post: Dear Walmart, Why is Your White Baby Doll Worth Less Than Your Hispanic and Black Dolls?